Opening today, across the water: Chicago Contemporary Circus Festival. With eight companies (seven North American, one Finnish) and as many full-length performances, a couple cabaret nights, a youth circus showcase, and a programme of 23 workshops/discussions/seminars, CCCF is another sign of the growing momentum of contemporary circus in the United States. A new initiative, and the first festival of its kind in the country, it's nonetheless driven by a collective desire that's been there for a long time: American circus artists would like to be able to present their own work in their own country. Chicago is one of a handful of cities in the US that already has a strong circus community and background, even if it's under-recognised and under-resourced. 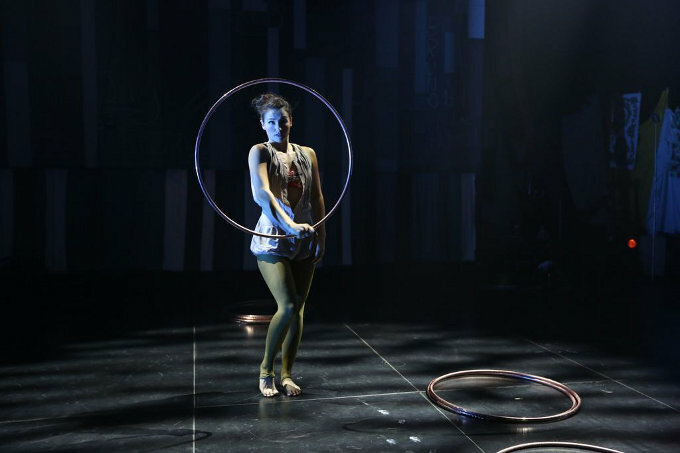 Shayna points to Midnight Circus and The Actors Gymnasium as two companies that were among the first to lay the foundations of a circus scene in Chicago, as well as name-checking Lookingglass Theater and the Lyric Opera as companies using a lot of circus artists in their productions. Shayna is herself the founder of the Aloft Loft, an 8000 square foot teaching and training space that houses the company Aloft Circus Arts and hosts the regular El Circo Cheapo cabarets (two performances of which are appearing at CCCF). Among those presenting work at the festival are The Acrobatic Conundrum, an eight-strong collective led by Terry Crane, a corde lisse specialist who's been forcibly removed from many of France's finest circuses; Dean Evans, a bouffon / grotesque / terror clown who inhabits the character Honeybuns (subject relaxes at home); and contortionist Andréane Leclerc, whose piece Cherepaka: The Death of a Turtle is inspired by Deleuze’s philosophy and Francis Bacon’s paintings. The festival has also supported the development of a new piece, Running in Corduroy, by the artist Brian P. Dailey, and has plans to commission more works for future editions. Chicago Contemporary Circus Festival runs 6-12 January 2014. For more information see the CCCF website.